Happy New Year and I hope that today finds you full of hope and commitment for a productive 2015. I always love the positive energy that ushers in a new year and this year is no exception. A fresh calendar provides us with the opportunity to dream and live our days with intention. Today holds a very special place in my heart (and not just because it is the first of the year). Today marks the two-year anniversary of Produce with Amy and I am thrilled to celebrate it with a brand new recipe. I am thankful for the opportunity to share my passion for healthy food with my on-line community and I could not do it without the inspiration, feedback, and comments from my readers. I cannot begin to explain how much your support means to me. Thank you! One of the things that I love about blogging is the connections that I make with people across the globe. Living in the rural Upper Peninsula of Michigan it is easy to feel isolated and I love that when I click publish on a post all distance is erased. Instantly I can unite with other health enthusiasts and share ideas as we inspire each other to make positive choices in our lives. During the holiday season I received many inquiries about plant-based dishes to pass at a party. Since I try to follow a plant-based diet, social gatherings can be tricky. I have found that it is important to go beyond the standard fruit or vegetable tray and bring something that is filling. While protein packed hummus is often my go-to choice – it can get a little bland and boring – so I try to give it a boost with a variety of ingredients. 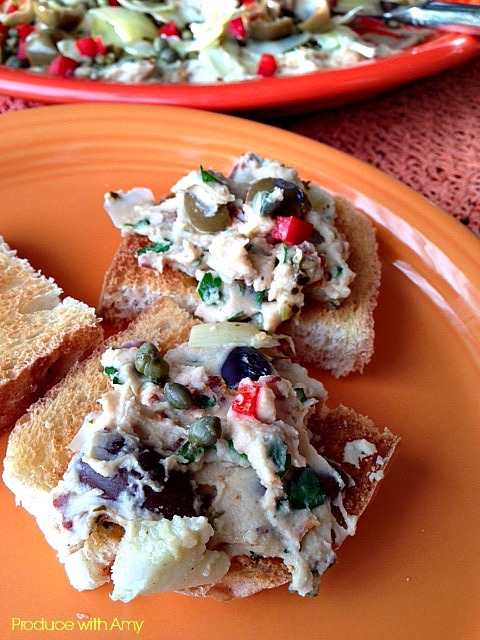 If your hummus needs a little interesting nudge, I think you will enjoy this recipe. 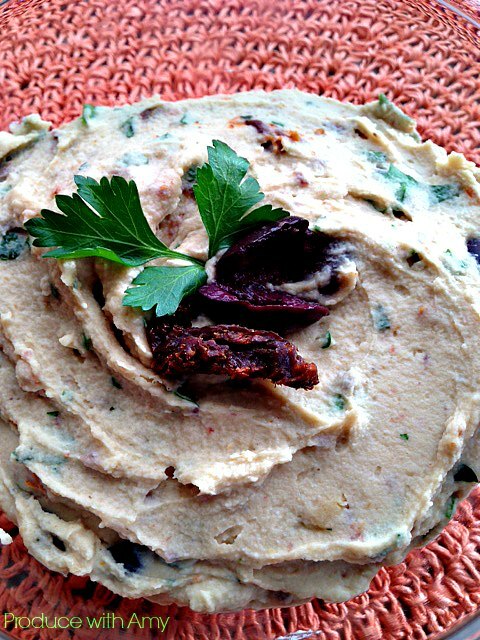 Stir in oregano, sun-dried tomatoes,Greek olives, and parsley to hummus. 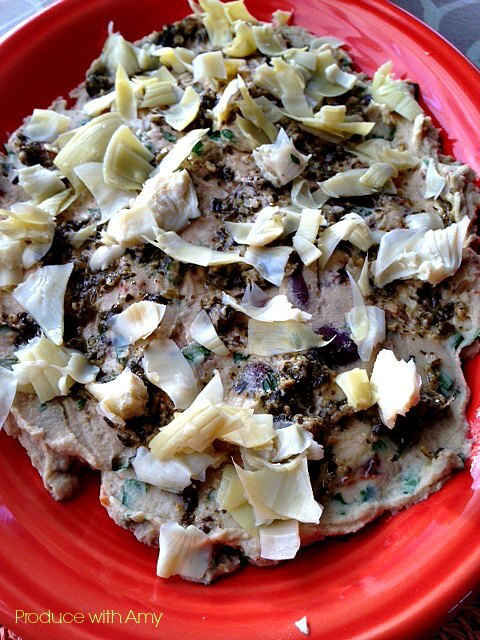 *Note – in place of raw garlic I added one head of roasted garlic to my hummus. Spread hummus evenly on platter. 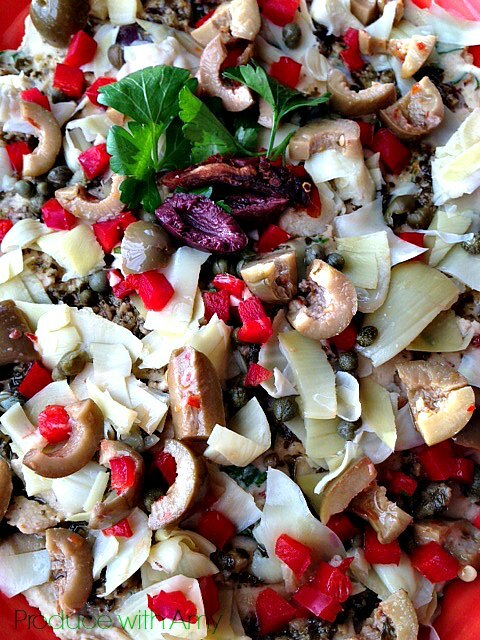 Sprinkle on artichoke hearts and bell peppers. 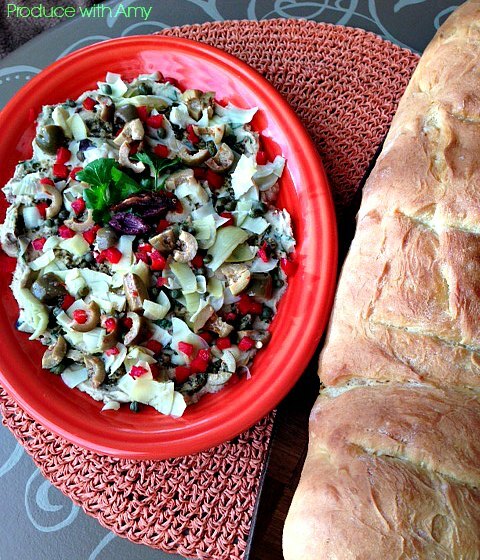 Drizzle with pesto and add the green olives and capers. 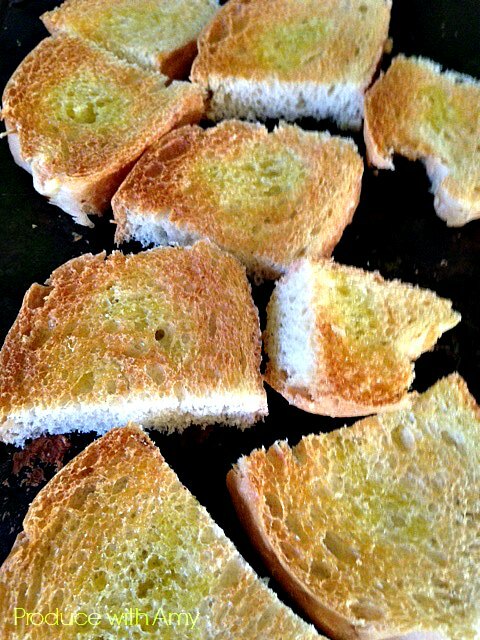 Slice bread, brush with olive oil, and toast in the oven or broiler until crisp. Serve and enjoy! If you are looking for other ideas to bring to a gathering you may be interested in my recipes for Layered Greek Dip with Hummus & Tzatziki Sauce and Layered Refried Bean and Guacamole Dip. I hope that you join me in celebrating Produce with Amy’s two-year anniversary with a burst of productivity and healthy choices. Make sure you stay up to date with my recipes by following my posts by email, by liking my Facebook page, and connecting with my other social media links on the right of this page. I wish you health, peace, and plenty of laughter. Let’s thrive together in 2015! 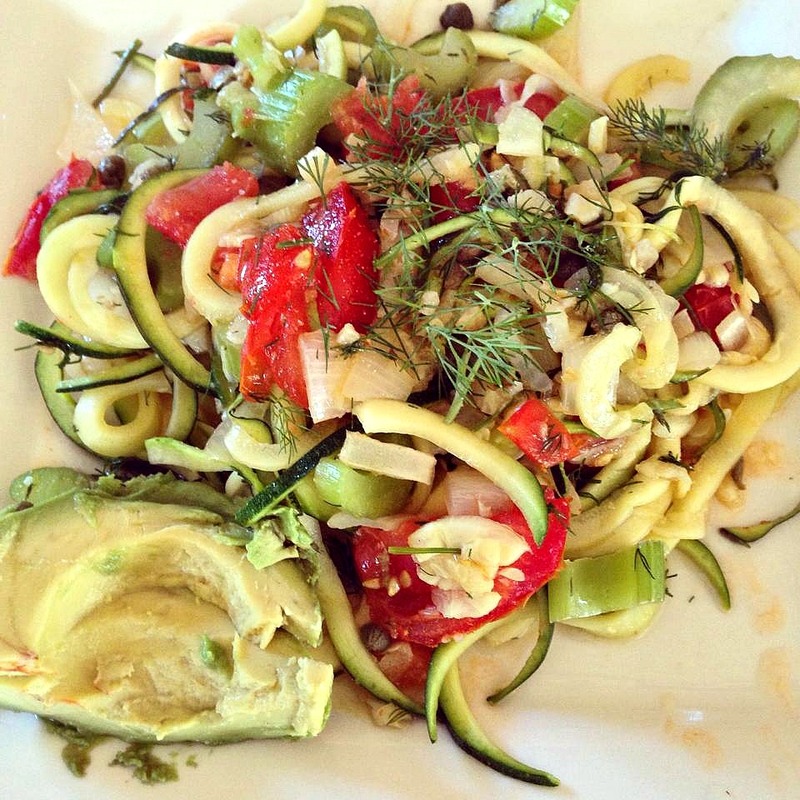 Last week I proclaimed that perhaps my husband Mike and I needed an intervention because we were obsessed with zucchini noodles. At least it is a healthy addiction. We love them raw, lightly sautéed and topped with marinara sauce, mixed with my bruschetta topping (future post), tossed with pesto, and simmered in soup. The combinations are endless. 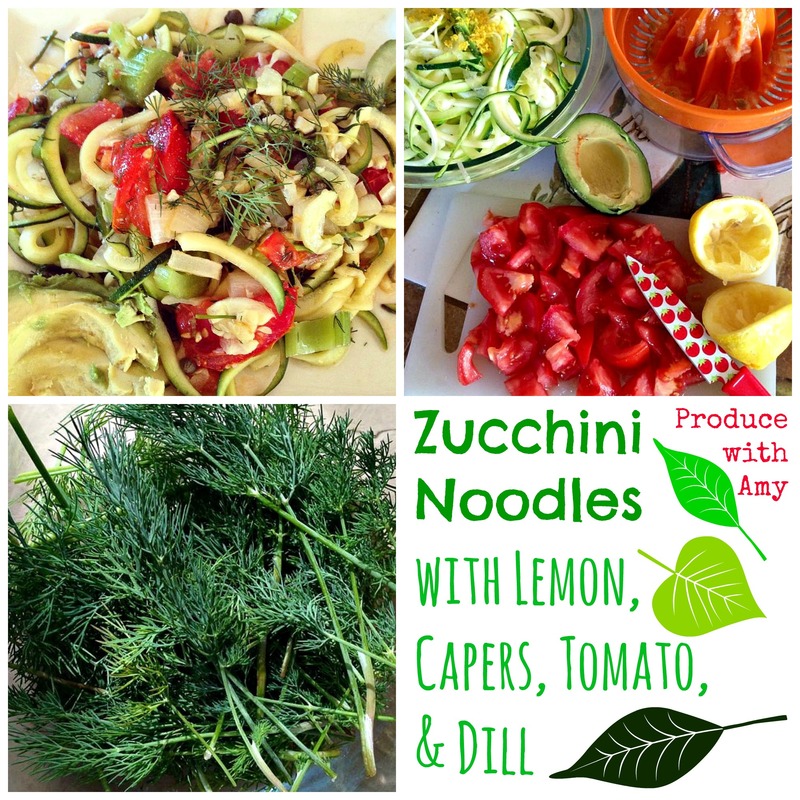 Summer is the perfect time to experiment with different zucchini noodle combinations because I have fresh herbs in my garden which really enhances the taste of sauces and other dishes. 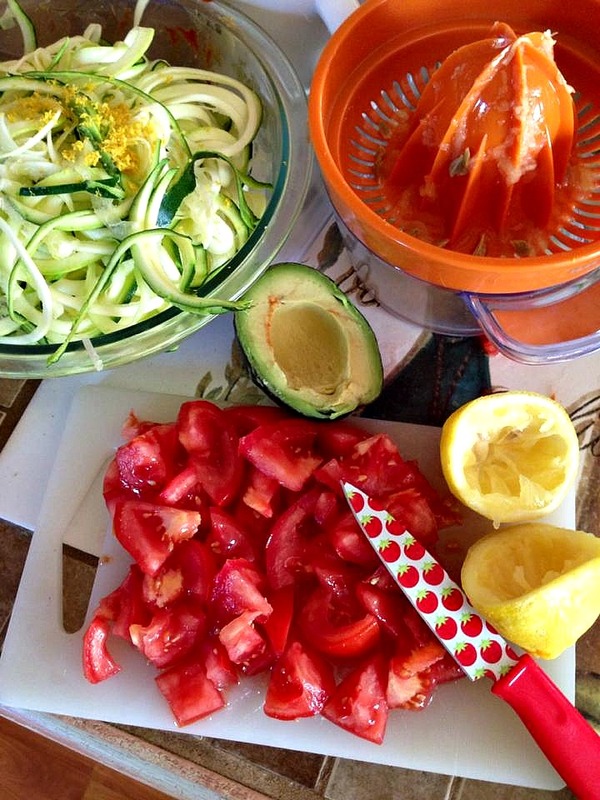 I purchased my spiralizer from Amazon and have had it for a year now. 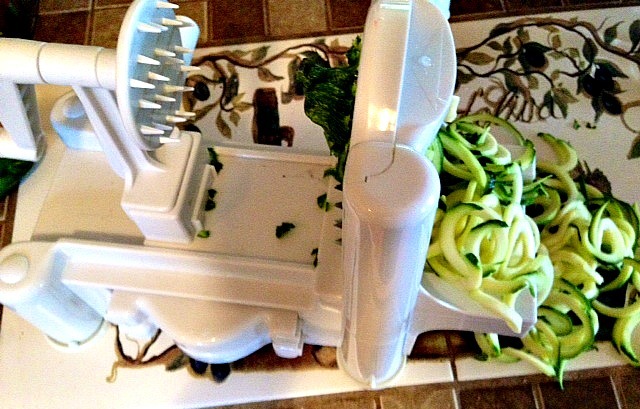 Even though I am a food blogger, I am not a huge fan of kitchen gadgets but a spiralizer is an exception. 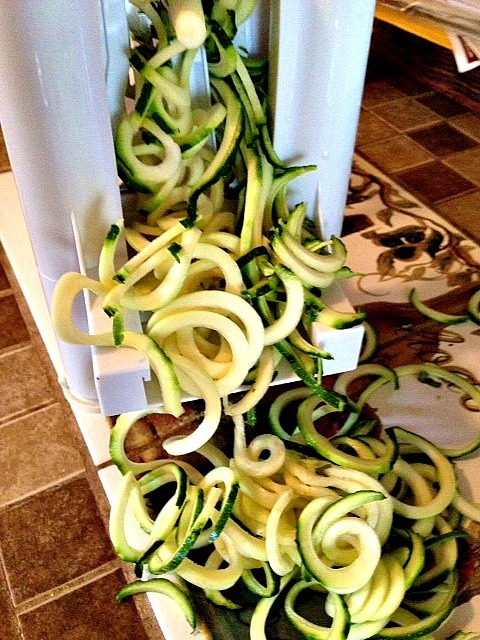 I wash the zucchini and leave the peel on and within less than a minute I have piles of 0 Point Plus zucchini noodles. 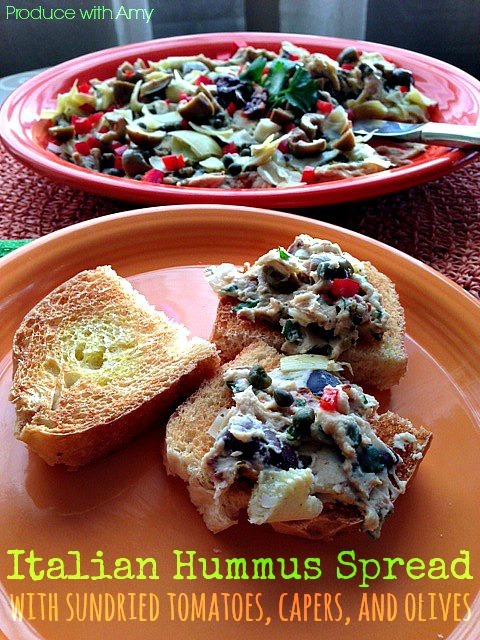 They are a healthy substitute to pasta and if you try them, I bet you will be hooked! You can even mix in a small amount of whole wheat spaghetti if you so desire. 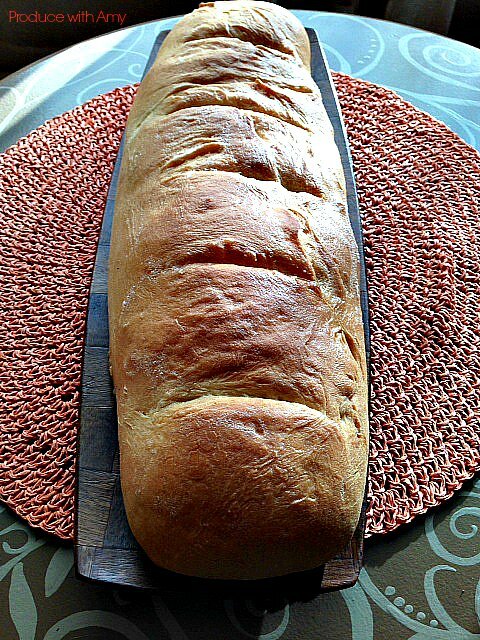 The recipe that I am sharing today is unbelievably quick to make and delicious. 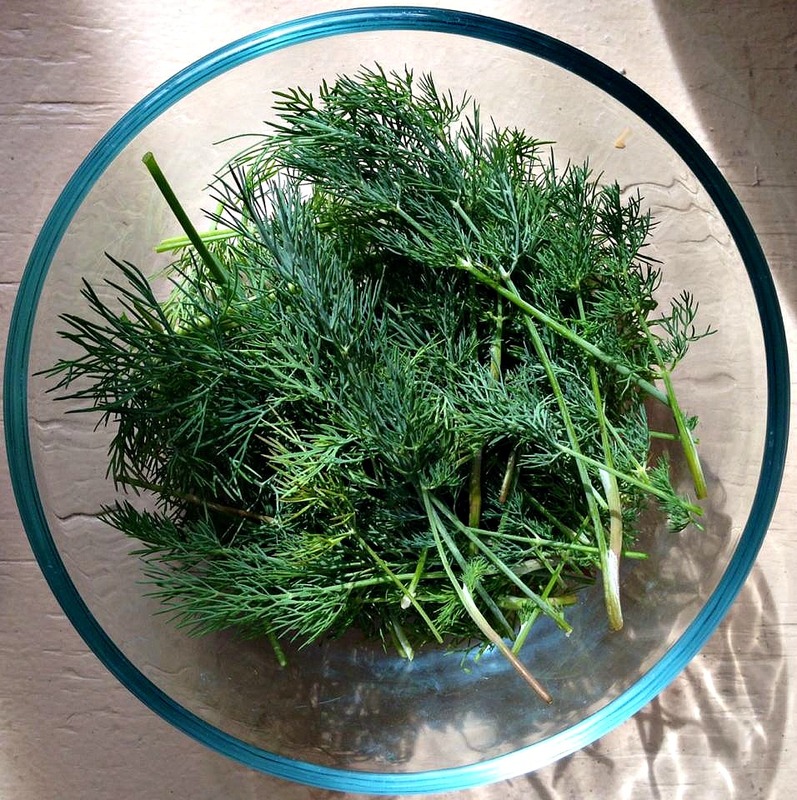 My husband and I are both of Finnish heritage and we LOVE dill. Sautee the onion, garlic, and celery in the oil for a couple of minutes. Add the vegetable broth, tomatoes, lemon juice and zest, capers, olives, and simmer for a couple of minutes. 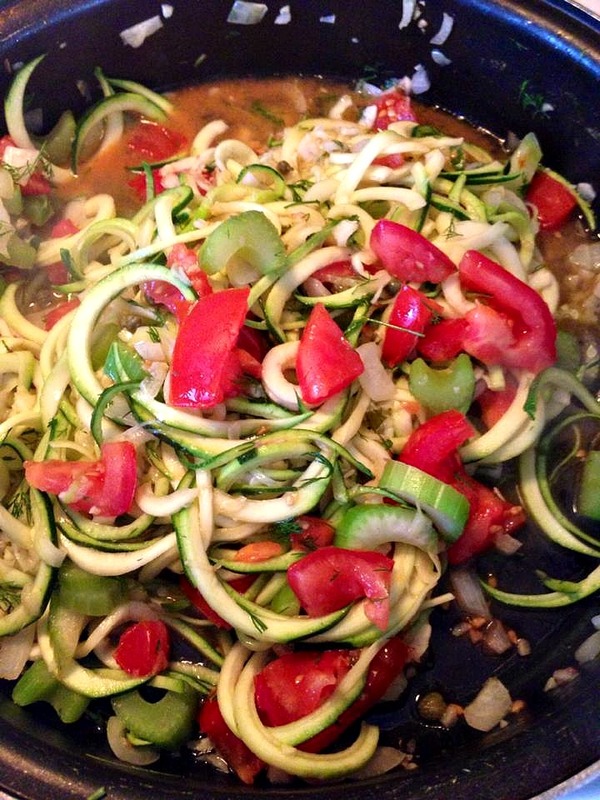 Add the zucchini and cook for a couple of minutes tossing the noodles in the sauce the whole time. I like the noodles Al dente and make sure that I do not over cook them or they will get mushy. It is not too late for you to join me in the Summer Green Smoothie Challenge. Today is day #6 but you can jump in anytime. Thank you for stopping by my blog and I hope that you are having a healthy and happy August. I promise to keep the recipes coming! 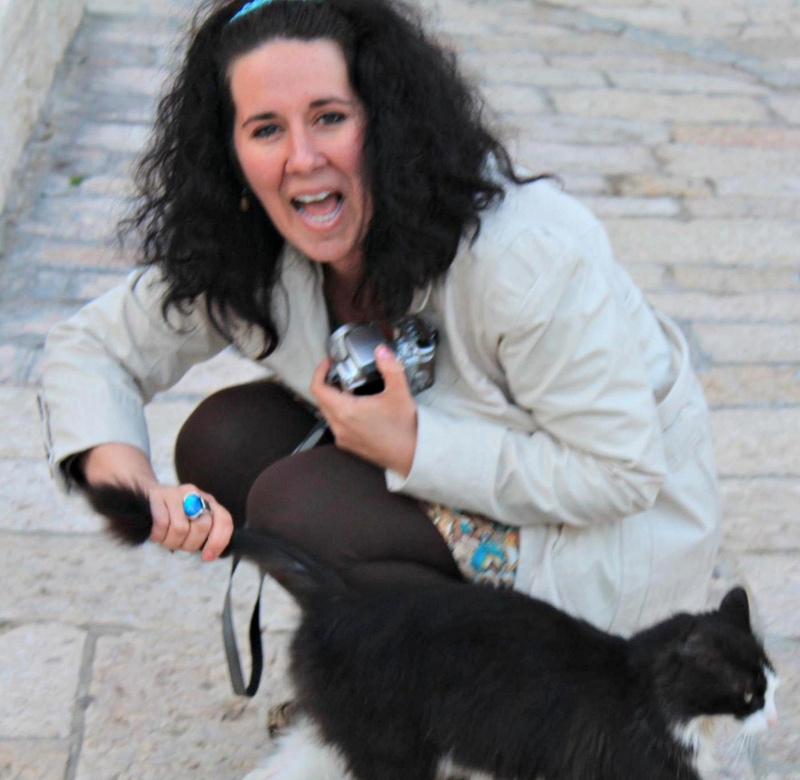 Amy in Jerusalem, Israel spring of 2011 making a new furry friend. 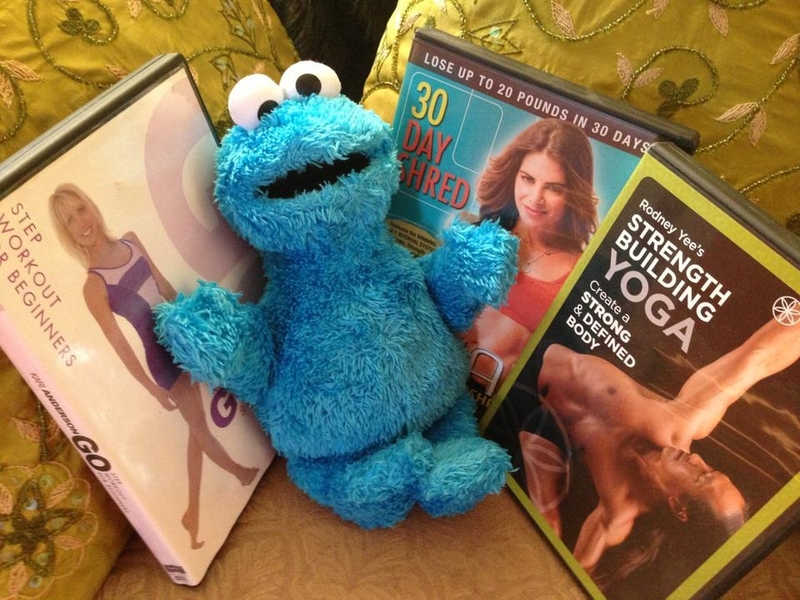 A few years ago when I agreed to lead a Saturday morning Weight Watchers meeting, I wondered if I had lost my mind. Being a teacher, my alarm screams every weekday morning at 5:00 am and weekends are my time to catch up on precious sleep. Though, I always contend that Weight Watchers meetings are like exercise. NEVER do I regret working out after the fact and it is the same with going to a WW meeting. Instead of remorse, I leave the parking lot feeling empowered and ready to tackle the food challenges thrown my way. Six years ago when I started attending WW meetings I would often come home Thursdays after work and tell my husband Mike that I was too exhausted to attend my weekly meeting. “But the meeting is your FUEL!” he would adamantly remind me. He was right. Even if I had a rough week and did not enjoy the number that the scale spit back at me, I always left feeling renewed and refreshed for another week. I am sure that the meetings made me much easier to live with since I came home happy and embracing a positive attitude, instead of being grumpy and charged with guilt. Once I started leading WW meetings I realized that not only did it feel fantastic to help others reach their healthy goals, but the meetings still remained a marvelous gift to myself. When WW introduced the latest program, Weight Watchers 360, we learned that studies suggest that we make approximately 200 food related decisions a day. Yet, we are only conscious of 10-15 of them. When this figure was brought to my attention, I could not believe it. But I thought about it. We are bombarded with food in a myriad of ways: television and radio commercials, roadside billboards, workplace temptations, meetings, event invitations, family gatherings, social media and the internet, and even Justin Bieber sings about, “chillin’ by the fire while we’re eating fondue.” (Okay, guilty confession…I like Justin Bieber) With all of these food related thoughts, I know that I need all the help I can get, and meetings help me stay accountable and on track. Saturday morning meetings are now one of my healthy Routines and I no longer cringe when the alarm sounds bright and early and I look forward to spending time with my friends. The number one reason that the meetings are so effective is because of my members. Each Saturday morning 30-40 individuals brave often gritty Upper Michigan weather to show up at the WW center in Marquette — armed with great advice, support, and compassion. Without fail, before the meeting starts, I walk to the front of the room and pause to listen to the laughter, conversation, and bask in the glow of beautiful, smiling faces. The positive energy in the room is tangible and I love being part of something so significant and life changing. On any given Saturday, Rockin’ Rosie shares with new members the “Rosie Method” of exercise. She explains that this exercise method involves a spirited jog around the house to heart pumping oldie songs. When the song changes, Rosie changes the direction of her jog. When people stop by unannounced, if they want to visit, they must accompany Rosie and jog along with her. You probably get the idea that nothing stops Rosie. She is fierce and resourceful. While she does attend training sessions at a local gym, Rosie reminds us all that there are no excuses not to move more! All we need is our own body and some of our favorite tunes. Rosie is currently on the mend from a shoulder replacement surgery. But you guessed it, nothing is stopping her! A couple days after her surgery she registered over 12,000 steps on her WW pedometer and was at our meeting the week after looking as gorgeous as ever (her husband helped with her hair and makeup). Challenge in February where we are all going to try one new recipe a week. 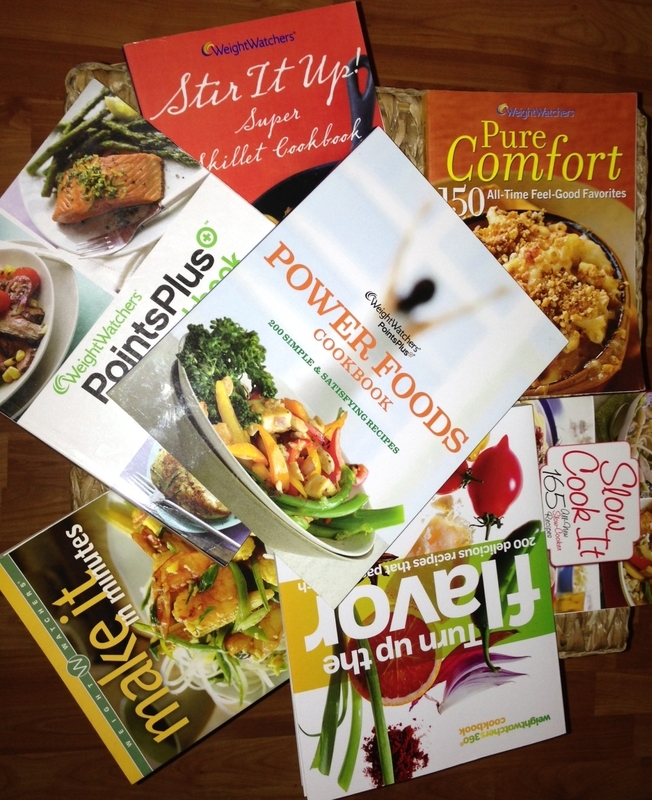 I will then compile a recipe book that will serve as a resource to help us all avoid food ruts. While Sister Gloria’s life work takes her on the road often, we really miss her when she is not able to attend Saturday meetings. Though we are all able to stay connected via our private facebook group. Our use of social media allows us to extend our meeting time and gives us a valuable tool to stay accountable. Brenda posts an Activity thread each morning which encourages exercise accountability and I have been posting a January Green Smoothie Challenge thread which has given our group great ideas for tasty smoothie combinations. We share recipes, links to pertinent nutrition information, and give each other support. 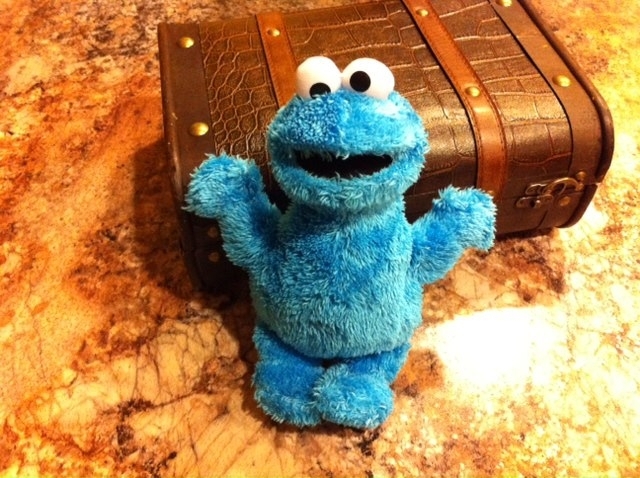 A few years ago, one of my members Theresa, bought herself a little stuffed animal to keep herself accountable to the WW program while she was traveling. Her little guy traveled to San Diego, London, and Australia with Theresa and the pictures she posted of him were adorable. I really admire Theresa’s sense of humor and she reminds us to always be “faithful to the little things.” Last summer I wondered what would happen if we had a WW Saturday Morning Mascot to serve as an anchor for our journey? 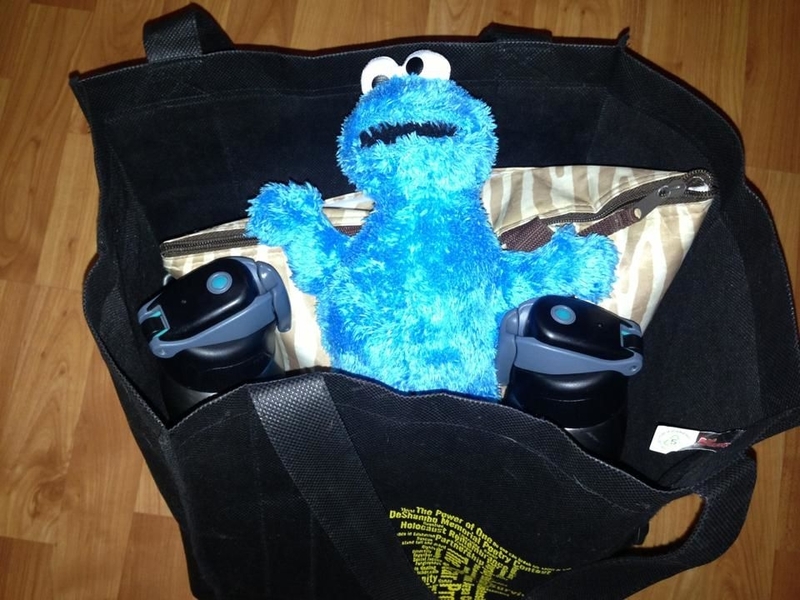 My husband thought I really had a screw loose when I went to Target and bought a Cookie Monster, a journal, and a little suitcase from Michael’s to transport him.Though, I knew my members would get a kick out of the idea. He’s packed and ready to go! In meetings we talk about how it is a shame as we get older we often lose our excitement for exercise. l like to remind myself that as a child I loved to run through the sprinkler, roller skate, spend hours swimming, and ride my bike until long after it was dark. As we age, we have to continue to find ways to channel our inner child and let laughter be our guide. Our mascot’s inaugural, naming trip was to a water park in Green Bay, Wisconsin with Brenda and LeeLa, who are Maintenance Buddies. At our next meeting LeeLa shared how “Freddie” helped remind her and Brenda that we need to have fun on our weight management journey. 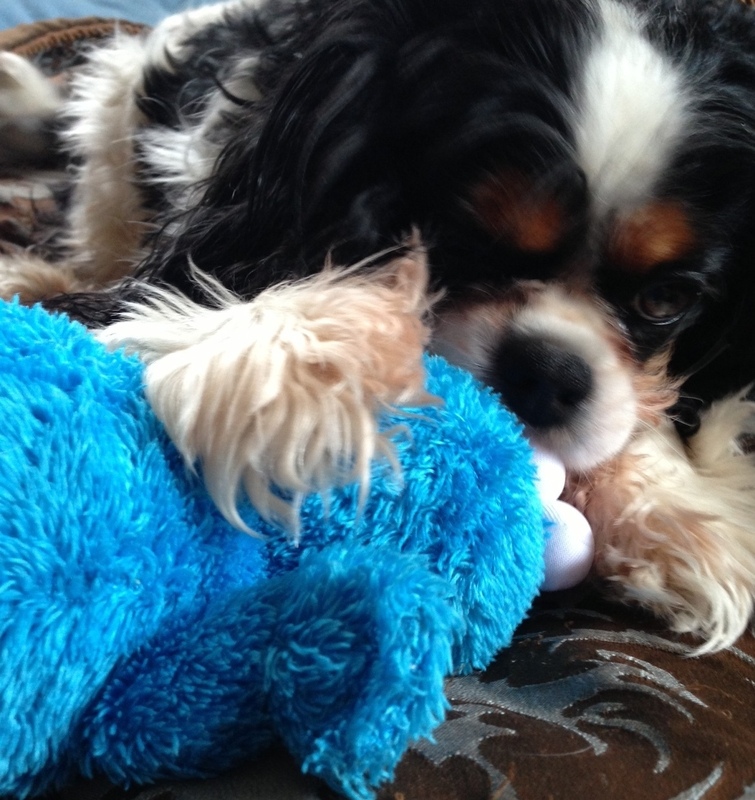 Not to mention, that Freddie is an important anchor that stresses cookies are an occasional treat and not a snack. Since his first trip last July, Freddie has experienced many healthy adventures. He has been to a Maroon 5 concert with Denise, sat in box seats at Lambeau Stadium and a wedding in Minneapolis with Colleen, has traveled to Chicago with Mary Alice, helped Sue make green smoothies for a basket making retreat, went to The Monkees concert with Erinn, helped Brenda stay balanced in preparation for a frightening medical procedure, and attended a parade and went camping with Linda. A few weeks ago, Freddie made us all envious when he departed to sunny Arizona with Karen. He is currently spending the week with Wendy and she checked in with us on our facebook group and said Freddie’s reminding her to take time from her hectic work schedule to log time on the treadmill and enjoy a cup of hot tea to de-stress. Recently Freddie came home with me and I even took him to my classroom at Gwinn High School. Even though I teach English I love being a healthy role model for my students and when we discuss goal setting I often share my health goals with them and even my blog as a real world example of writing and publishing. 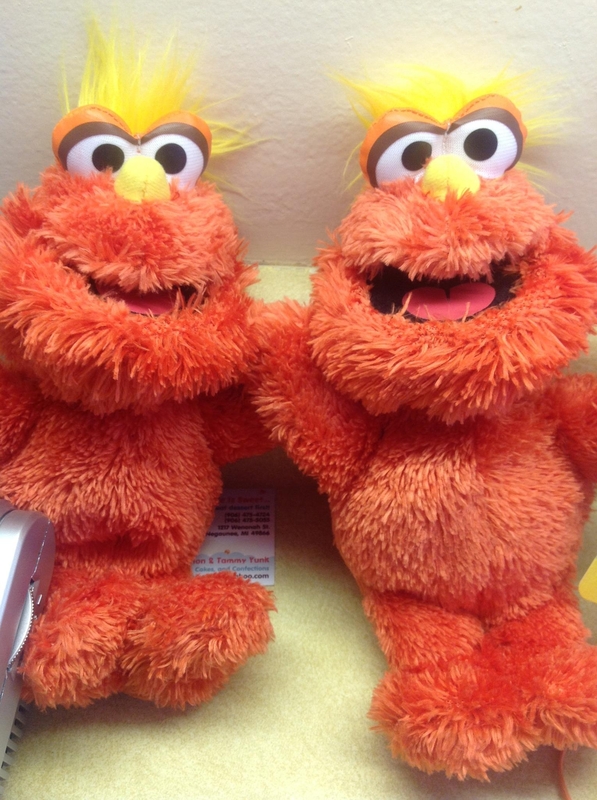 Freddie was an instant hit and my 4th hour creative writing students even decided to adopt three writing mascots. They will take turns bringing the mascots home and I am going to start a blog for the pieces that they write. I cannot wait to see the stories that they capture. Freddie looking a bit shocked at how early we have to go to work. 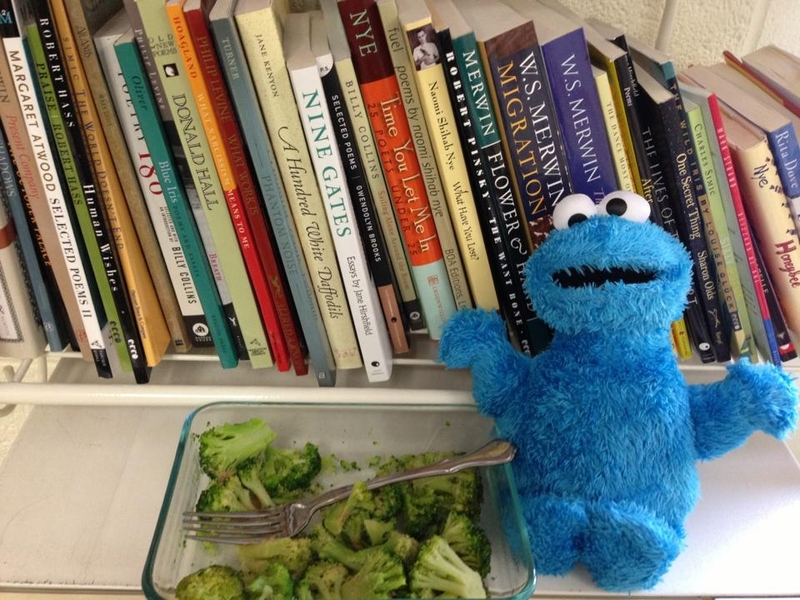 Freddie enjoying a snack of broccoli, lemon, and nutritional yeast during our prep period. Not only does he love healthy food but he’s also fond of W.S. Merwin’s poetry! Freddie and I walked laps around the hallways during lunch. Is it strange that I carried him around for 20 minutes and no one looked surprised? 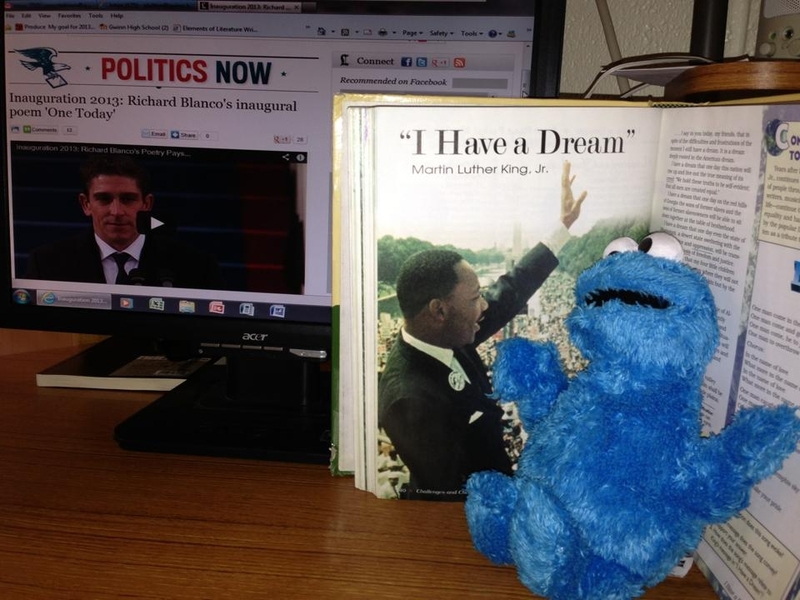 Freddie watching a video of the Inaugural Poem, “One Today,” by Richard Blanco — and reading MLK’s “I Have a Dream” speech. Freddie selected my workout videos. He is rather fierce when it comes to exercise! Freddie even helped me stay on track when we had two unexpected “Wind Chill” days off from school. 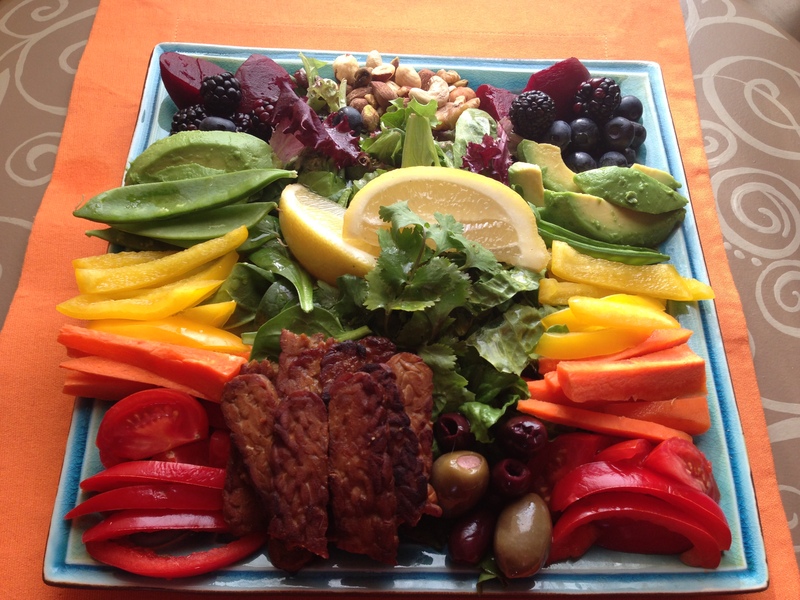 We made a rainbow salad with a vibrant medley of fruit and vegetables, 1/4 cup of raw nuts, smoky maple tempeh, 2 teaspoons of olive oil, and olives. 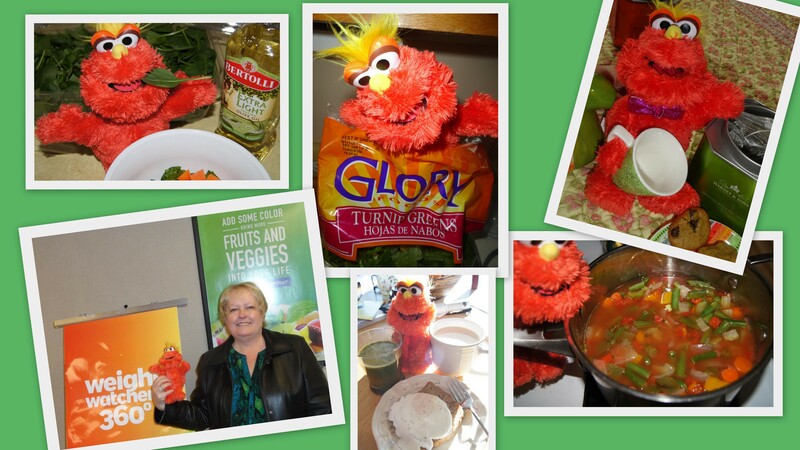 Freddie reminded me that I am worth all the extra steps I take to make food appealing, tasty, and fun! 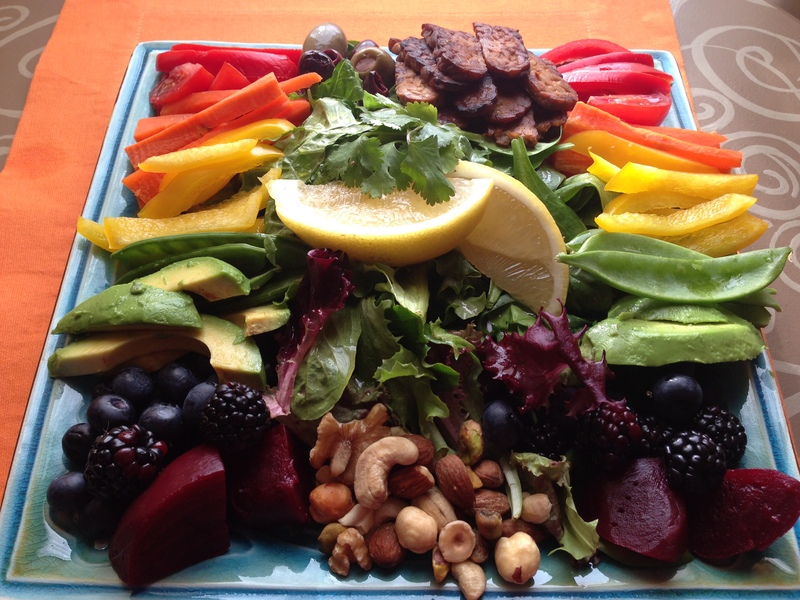 Freddie reminds us to fill our plate with a rainbow of fruit and vegetables! 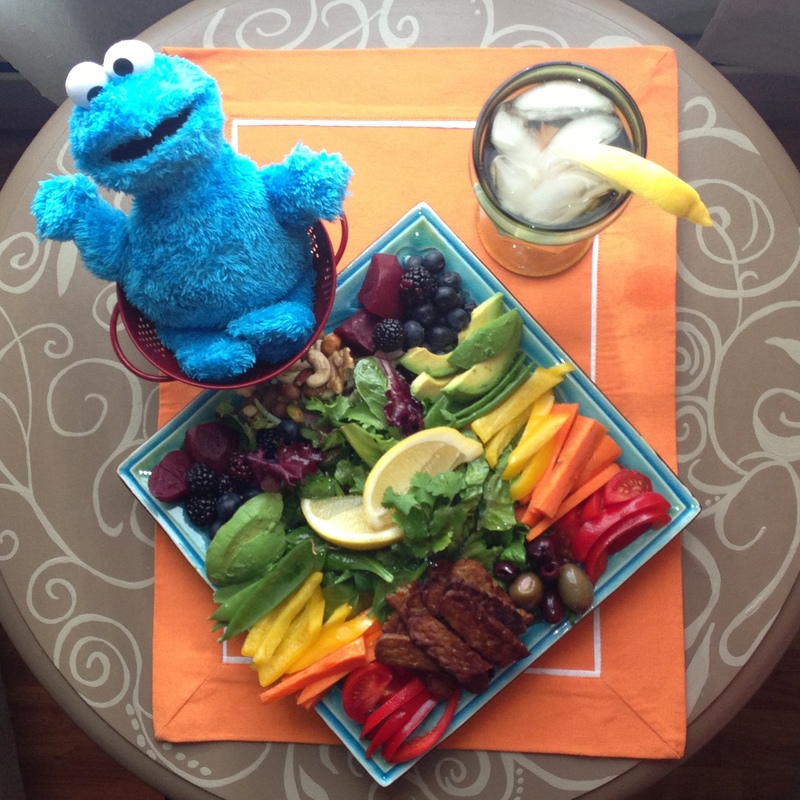 Freddie says food should be vibrant, playful, and fun! Closeup of my mouthwatering salad. There was enough to share with Mike when he got home from work. I find that food that I take time to prepare and savor is much more satisfying. 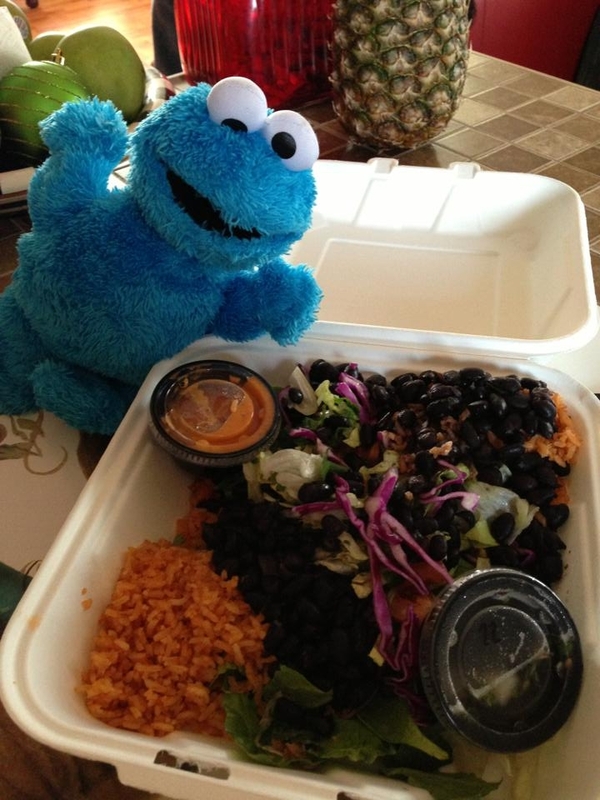 So take out your fancy plates and be creative! Photo-bomber Athena checking Freddie out! 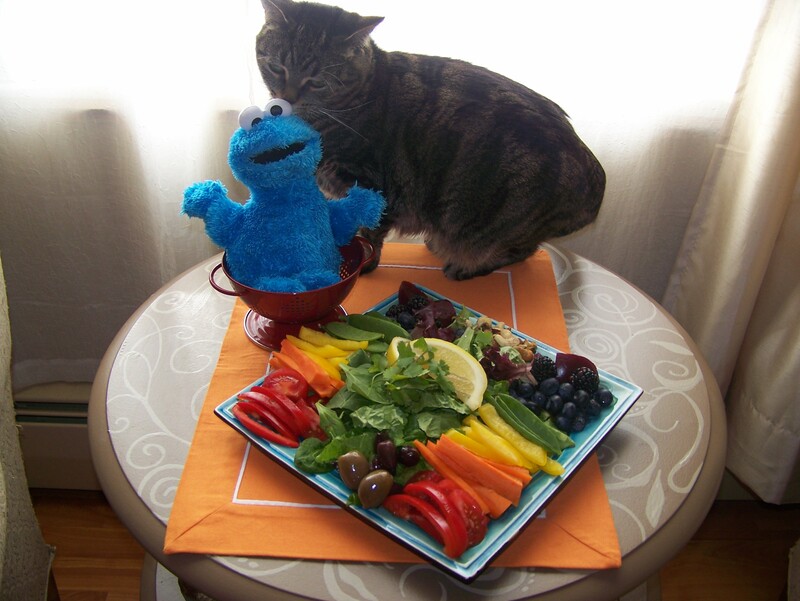 Freddie has been a popular addition to the Saturday Morning Weight Watchers meeting. So popular, in fact, that a couple members decided to get their own weight loss buddy to keep them accountable. Theresa, who was the inspiration behind Freddie, adopted Mr. Q. She dubbed him Mr. Q until she could find a proper name for him. However, she said that the name stuck because he was always asking her questions. 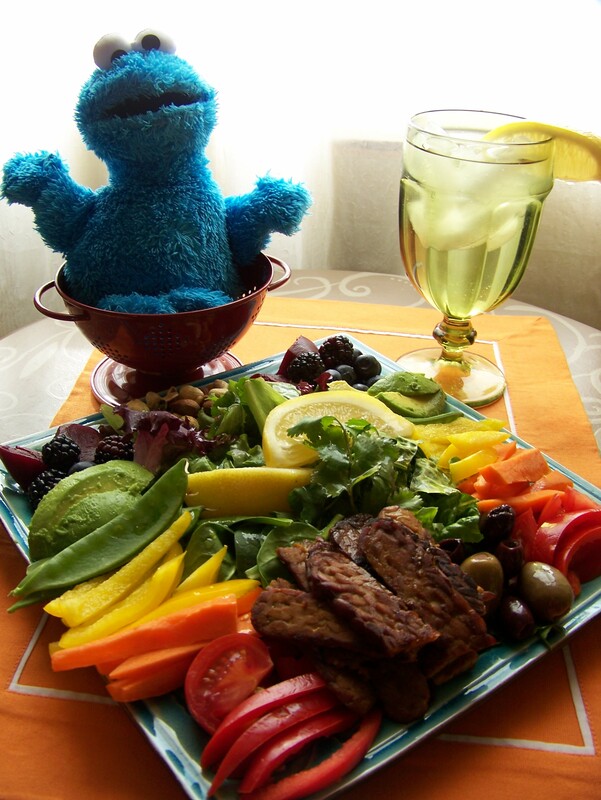 “How many Points Plus is that food?” “How many ounces of water have you had today?” “Do you have your Active Link on?” Mr. Q has helped Theresa have a WW friendly high tea with her grand-daughter and helps her make countless healthful choices during the day. I am so thankful for Theresa’s friendship and her priceless gift of laughter. I think that 2013 is going to be a phenomenal year for her and Mr. Q. 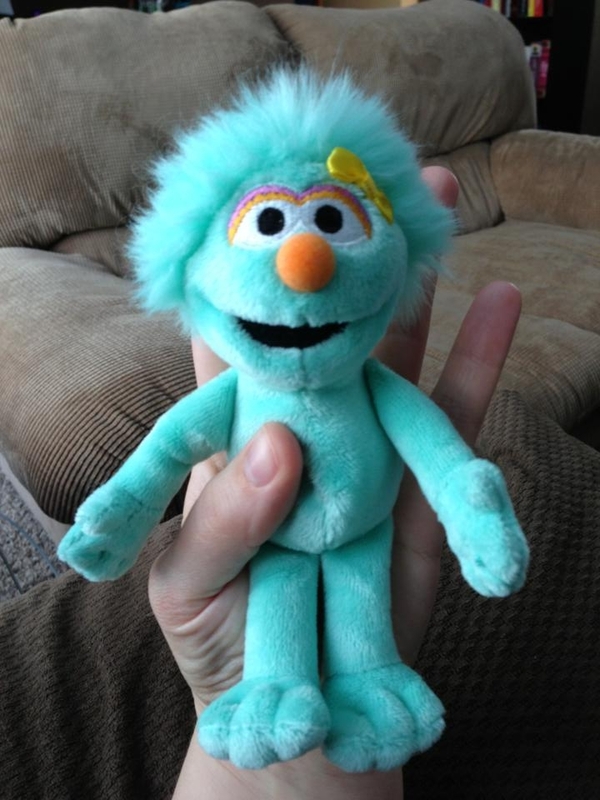 She is one of the kindest women that I know and bought her dear friend Linda a weight loss buddy who happens to be Mr. Q’s twin. 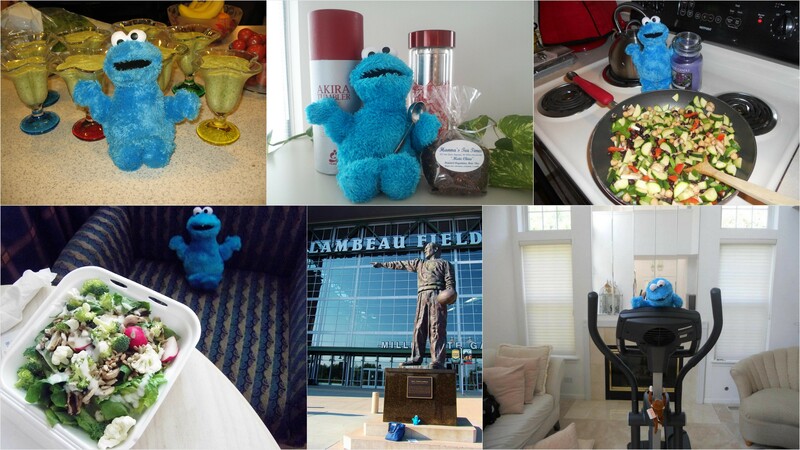 Theresa’s buddy Mr. Q really encourages healthy Spaces and Routines! Mr. Q and his twin. Theresa’s gift to Linda. 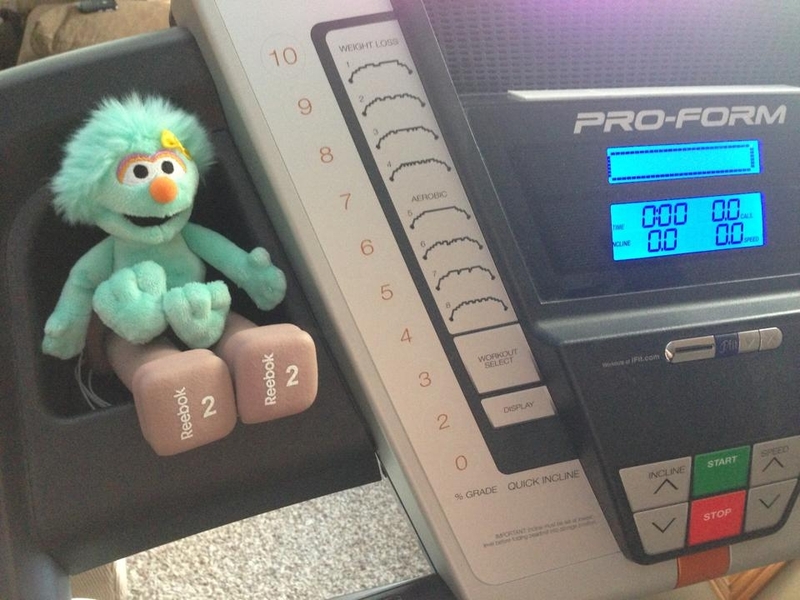 Erinn also recently purchased a buddy to help her stay accountable. Isn’t Myra a cutie? Erinn loves that Myra is small enough to fit in her handbag and keep her accountable wherever she goes. She said they also have been stopping to access whether a snack is healthy and that her kids are interested in learning about nutrition and how various foods impact their bodies. Erinn is a source of inspiration to us all as she asks questions and takes advantages of the tools that WW gives her. 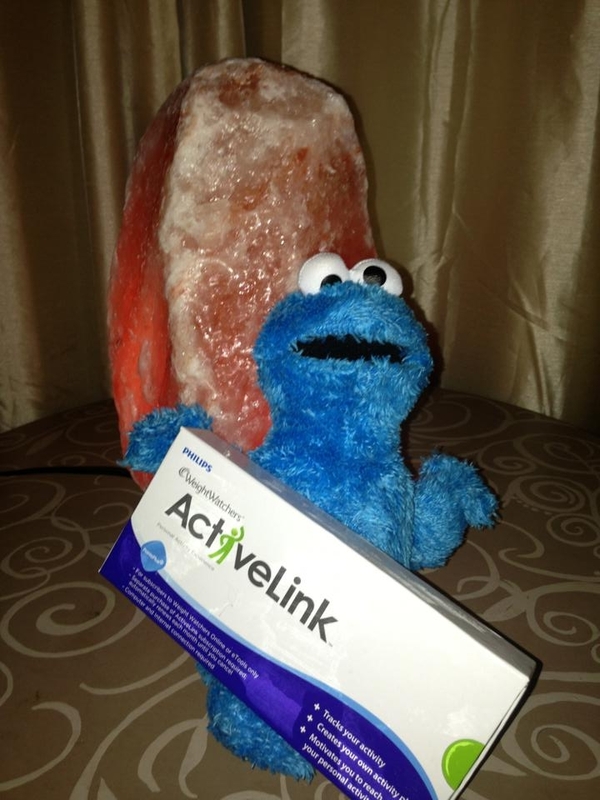 I cannot wait to present Erinn with her milestone awards as she reaches for her healthy goals in 2013. Myra cheering Erinn on as she completes her daily workout on the treadmill. As the year progresses I can only imagine the adventures that await Freddy and the exciting places that he will travel. I know that he needed a bit of rest after a week at our house. Especially after I had to rescue him from a harrowing experience with our dog, Phoebe. I will say that Freddie really has balanced my life in multiple ways. Not only did I lose two pounds the week that he stayed with my but he did urge me to do something rather wild! 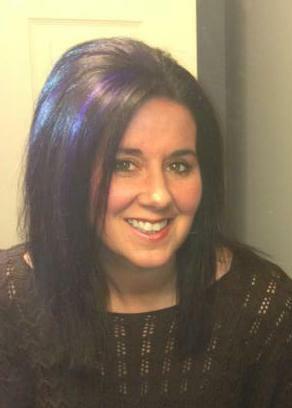 Amy’s new shimmery, violet highlights. For the past couple years I have wanted purple highlights in my hair and last week I decided to go for it. I channeled my inner child and rediscovered my love for all things purple. Thank you Freddie for helping me be proud of who I am and for encouraging me to continue to chase after the woman that I am becoming. 2013 is not only going to be my year to be productive and healthy, but I am also going to remember to have a ball and laugh as much as possible. I hope that I inspire those who read my blog to do the same thing.